I arrived on site with Anthony Haynes, Malcolm Mitton and Neil Garfield just after 06.00. 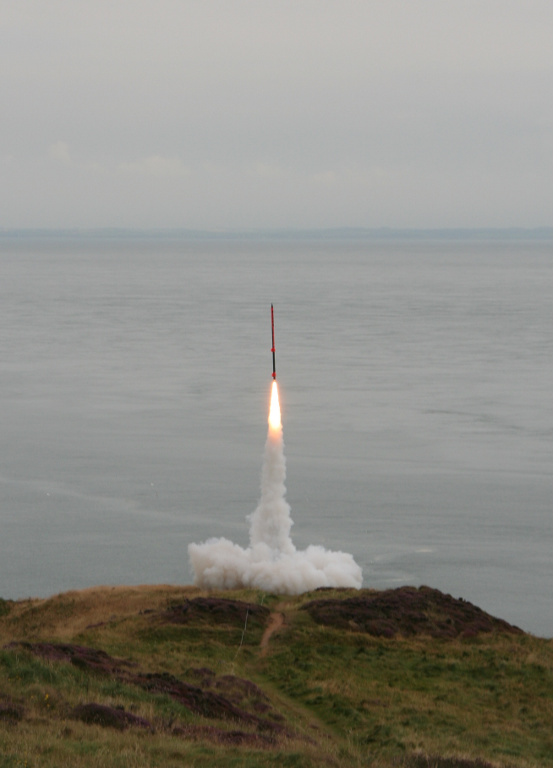 We went to check over the area and select the launch and control positions based upon the conditions of the day. We decided to place the pad on the last section of cliff top on the peninsular, this is above Lagvag point and slopes gently to the east. It was also decided to designate the helicopter pad as the viewing area and place the launch control point on a rock outcrop approximately 10 metres downhill towards the launch pad. The sky overhead was clear with cloud cover visible on the mainland and slight groupings apparently down wind. 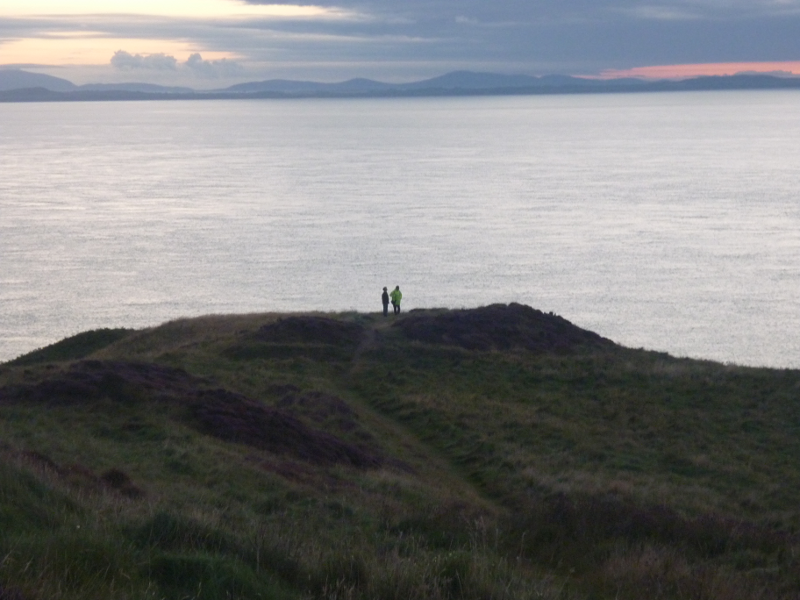 Anthony and Neil at the launch site, from the viewing area. We returned to the car to collect tools and met the Bolton Science and Technology Centre (BSTC) minibus at the RSPB reserve car park; Centre director Torben Steeg, leading the BSTC party in the minibus placed the bus adjacent to the RSPB visitors centre and the team unloaded the equipment. Andrew Dutton of the BSTC then led Jordan Cropper, Evlyn James and Brad Crowder (all just leaving the sixth from at Canon Slade School in Bolton and Ramesh Krishnan (just leaving the sixth form at Turton School in Bolton) in preparing the payloads while Anthony, Malcolm, Neil and myself prepared the Aerotech motors. These were successfully assembled in line with the Aerotech instructions and the motor team completed the igniters and second motor while Neil Dykes of COMET and I saw to the assembly of the 1st stage, parachutes and then the 2nd stage. 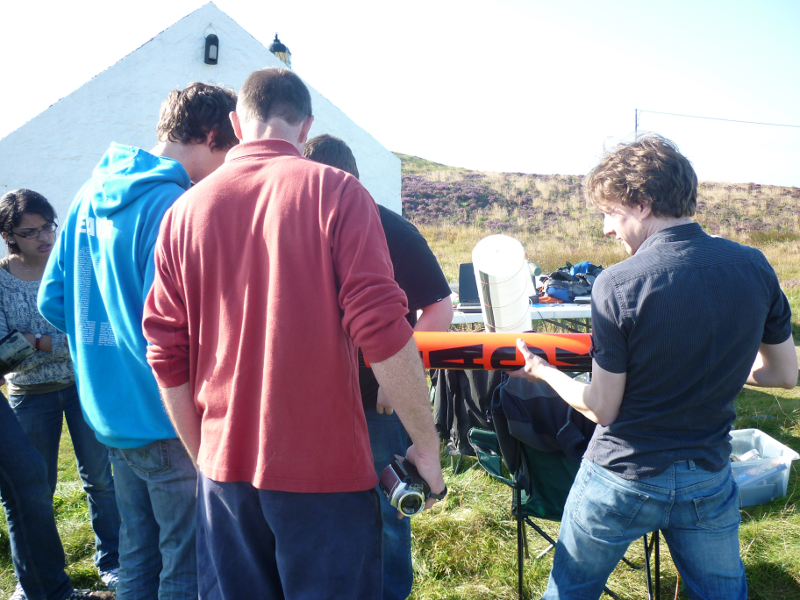 Evlyn, Jordan, Andrew and Robin installing the payload, Brad just off shot. The 1st stage contained one 28” Skyangle parachute, one SeaPro automatic life jacket, one G-Wizz LC400 deluxe parachute controller and one parachute charge. The G-Wizz was tasked with igniting the 2nd stage motor directly after the inertial detection of 1st stage burn-out and deploying the parachute and life jacket at apogee. 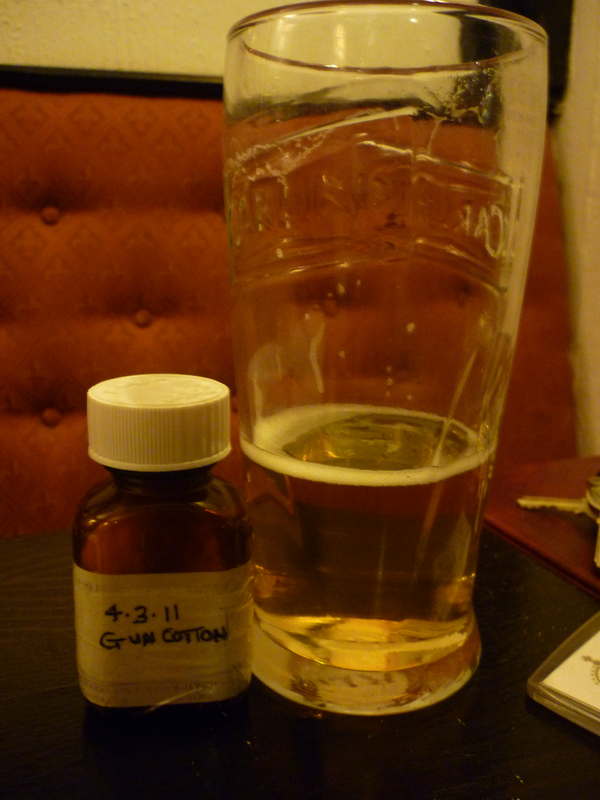 The G-Wizz was prepared in a plastic tube with key switch which was intended to be slid in with the fabric components, such that the key switch was accessible through a port. This proved impractical and the switch was removed in favour of trailing twist wires. These were left fully insulated until installed in the pad. 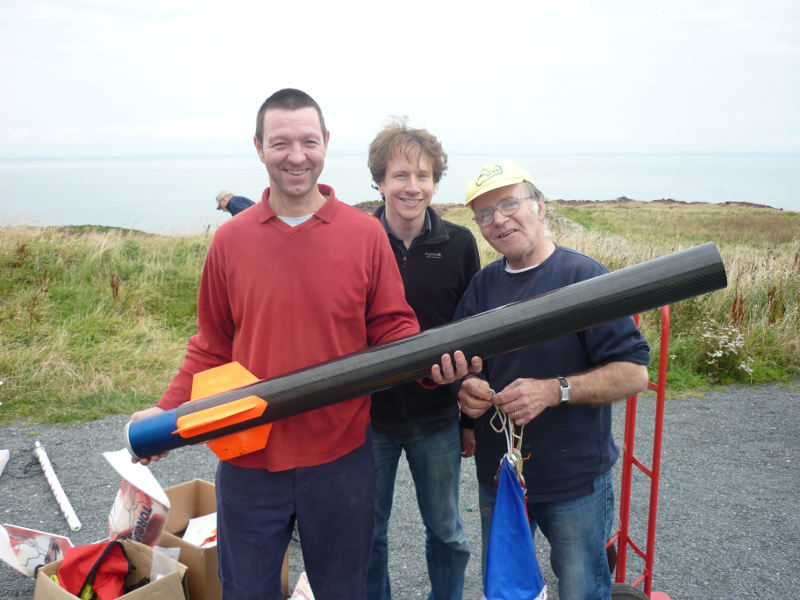 Neil Dykes of COMET with payload module. Both stages were equipped with three Daveyfire igniters sandwiched in a block of additional propellant. This was then glued together and the propellant block provided an interference fit in the motor port to support the igniters at the top of the motor. The motors were then installed in the rocket by screwing an eye-bolt through the thrust bearing bulkhead into the threaded motor cap. The slight play around the motor case was removed by shimming the motor with cartridge paper. 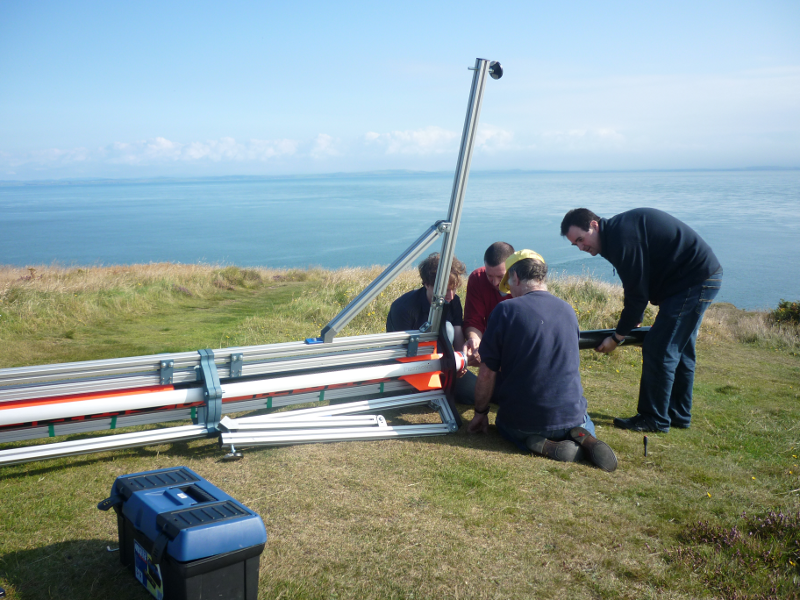 In the meantime the launch pad and ignition system were assembled in the horizontal position by Mark Gilbert, Angela Gilbert, Evlyn James and Brad Crowder. As they were completed all three modules were carried down to the launch site. The 2nd stage consisted of the 2nd stage propulsion module and the payload module, a 20” drogue parachute and SeaPro life jacket were packed in the top of the motor module and a 60” Skyangle main parachute was packed in the rear of the payload module. The payload module contained the experimental electronics and an RDAS rocket controller with GPS and Telemetry modules. The RDAS was intended to relay GPS data to the ground and ignite the drogue parachute charge (deploying both the drogue and the life jacket) at apogee and the main parachute charge at 200 metres barometric altitude. The parachute charges were all identical, 2 grams of black powder contained in plastic pots over-wrapped with layers of tape and ignited by a single Daveyfire igniter. This was primarily evolved for the high altitude 2nd stage drogue parachute charge, but was used for the other two charges as an effective package. 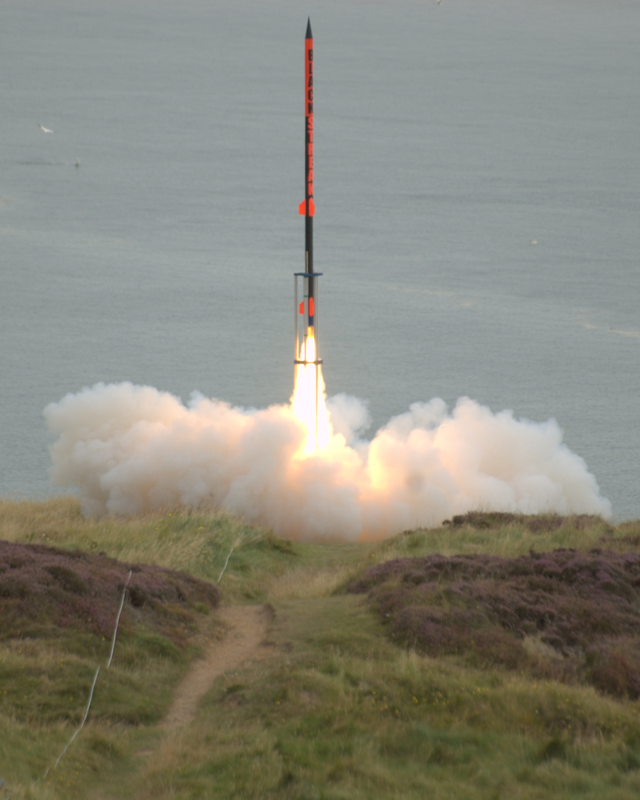 The 1st stage was connected directly to the G-Wizz, the two second stage charges were passed through the instrument bulkhead and connected to the RDAS. The level of preparation required pushed our readiness back to just after 10.00 and an extension was granted by military ATC. The 1st stage being connected to the installed upper stage. The payload module and 2nd stage propulsion module were joined next to the launch pad and slid into the horizontal guide. The 2nd stage igniters were connected to the G-Wizz contacts protruding from the 1st stage propulsion module and then the 1st stage was slid (with a paper shim in place) onto the 2nd stage motor. The whole assembly was then slid into the launch pad. 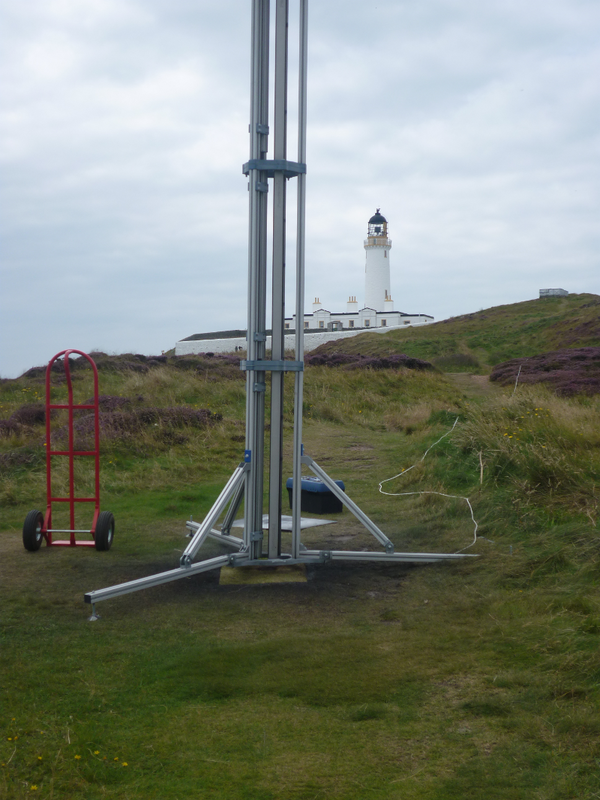 The launch pad was raised and in the absence of wind profile data was simply aligned to be within one degree of vertical. In the absence of a bracket to support the rocket off the ground it was lifted by the team to permit the connection of the launch control, this was done by means of a ceramic terminal block. The rocket was placed back with a screw driver to keep it off the ground, but the launch control showed no continuity. So the rocket was lifted again for disconnection. 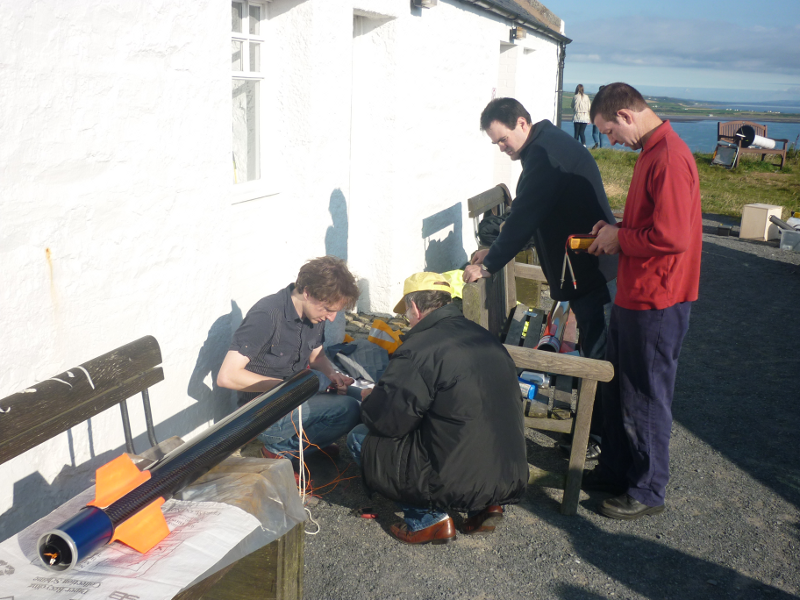 Connecting the launch controller to the 1st stage. The launch control was found to have good continuity and was supplying voltage to the pad, the bulb was found to be in error. 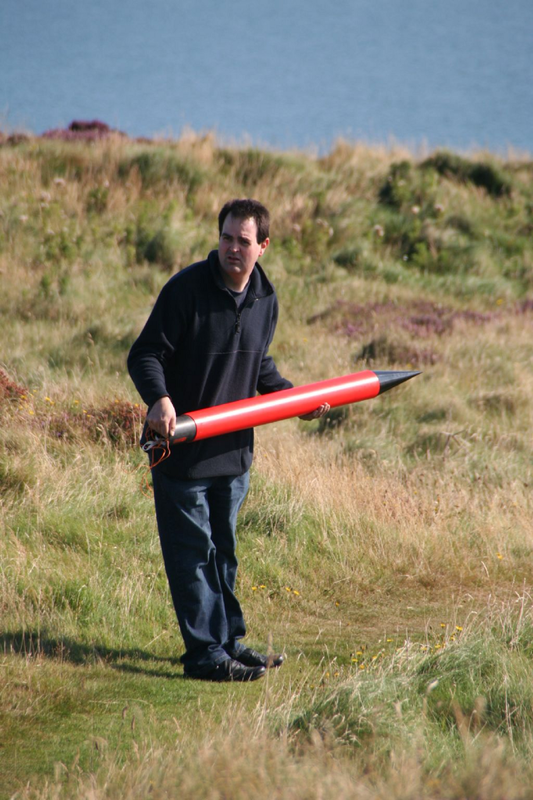 The rocket was reconnected to ground control and the G-Wizz armed with the twist wires. The RDAS had been armed before rocket elevation as it was not controlling propulsion. The launch crew retired to the control site, the spectators were alerted to watch the rocket and a countdown was made from 5. There was a slight delay as the person pressing the button had not armed the key switch, launching was called again directly and ignition made. The motor ignited promptly and the rocket accelerated smoothly through the pad. Subsequent video analysis shows a slight oscillation as the rocket accelerated but overall a good straight flight. It appeared to lean back slightly westward overhead the control point but given the landing locations this would seem to have been an effect of perspective. It entered the cloud base (which had blown in since 09.30) after 5 seconds, estimated to be 815 metres (2690 feet). The 1st stage motor was heard to burn-out at circa 7 seconds followed by the ignition and continued burn of the 2nd stage fading from hearing distance. A bang consistent with the 1st stage parachute charge was also heard shortly afterwards. 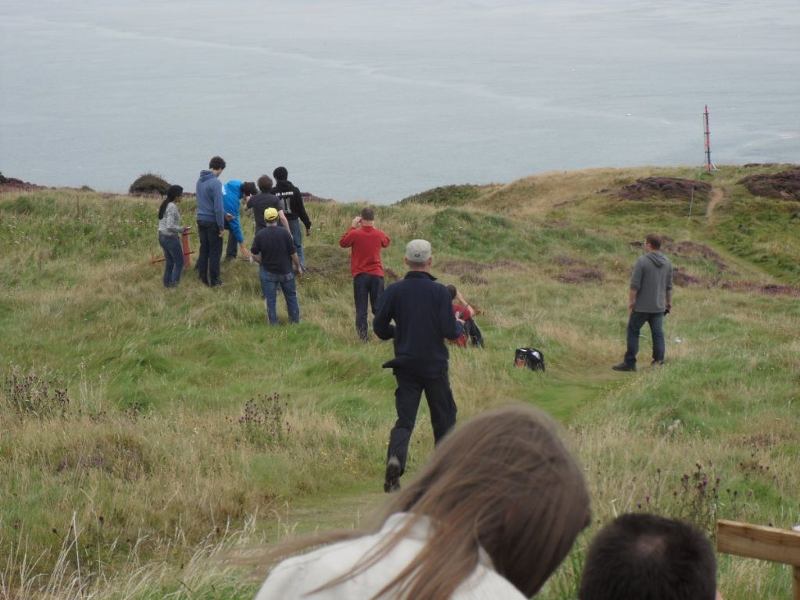 All spectators and crew watched for returning components and the 1st stage was seen falling into East Tarbet Bay as intended. No ballistic return air noise or impact was heard leading us to believe the 2nd stage experienced successful parachute deployment to some degree. After addressing the spectators and press the launch team proceeded to clear the site and the 1st stage was returned by the recovery boat. The life jacket had successfully functioned as an automatic floatation bag, though the parachute itself appeared to have tangled and not deployed properly. Given the relatively high design descent speed of this stage it had not significantly deviated from the expected landing point. Approximately an hour after launch team members returning to dismantle the launch pad believed they may have seen the main parachute floating below the surface of the sea just off the headland. They hailed a private fishing boat that had watched the launch to investigate and this was found to be the 2nd stage motor floating without a floatation aid. When it was returned to the team it was found to have broken the line joining it to the payload module, and had been floating solely through air trapped in the motor casing. A simulation of the flight was carried out as soon as the Met Office general aviation wind profile for the launch period could be collected from the Met Office website. 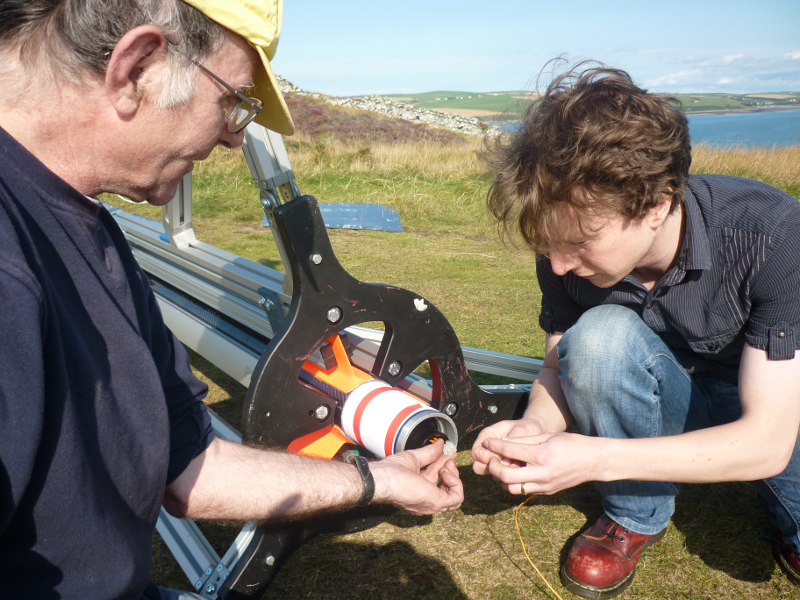 Despite the prevailing wind being southerly at ground level it was predominantly westerly above 300 metres (1000 feet). 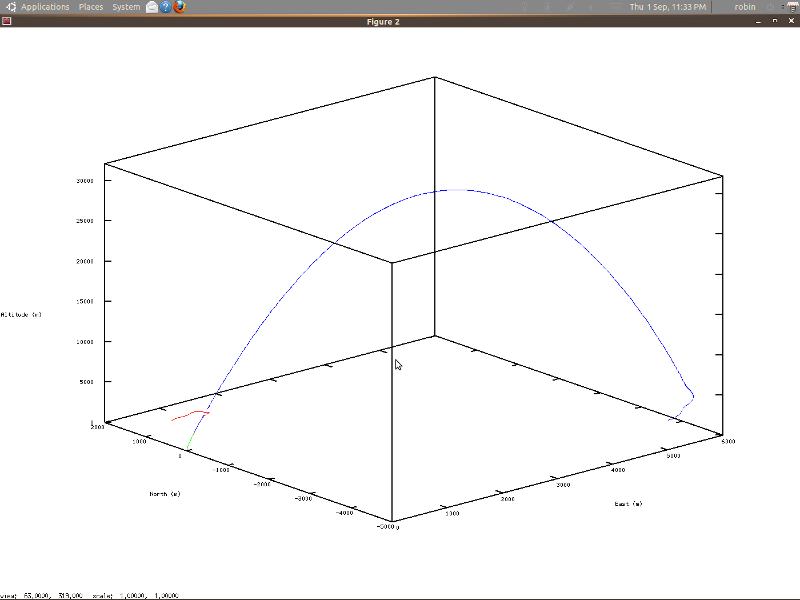 Upon running the simulation the 1st stage was predicted to land very close to the observed position. By contrast the 2nd stage was predicted to have arced eastward, deploying the main parachute and splashing down approximately 6km eastward. If the motor lanyard snapped at main parachute deployment, either due to the failure of the drogue charge or simply excessive deceleration from drogue to main, then it does not seem unreasonable that the tide could have swept the motor back to the headland in the time between launch and discovery. The 2nd stage motor was found without any life jacket or parachute implying that the payload section retained the drogue, life jacket and main parachute. This section is significantly lighter than the combine 2nd stage and would drift much further eastwards if it was on the parachute alone. The construction, and indeed the manner in which the 2nd stage motor was found, of the payload section should enable it to float even without the life jacket. 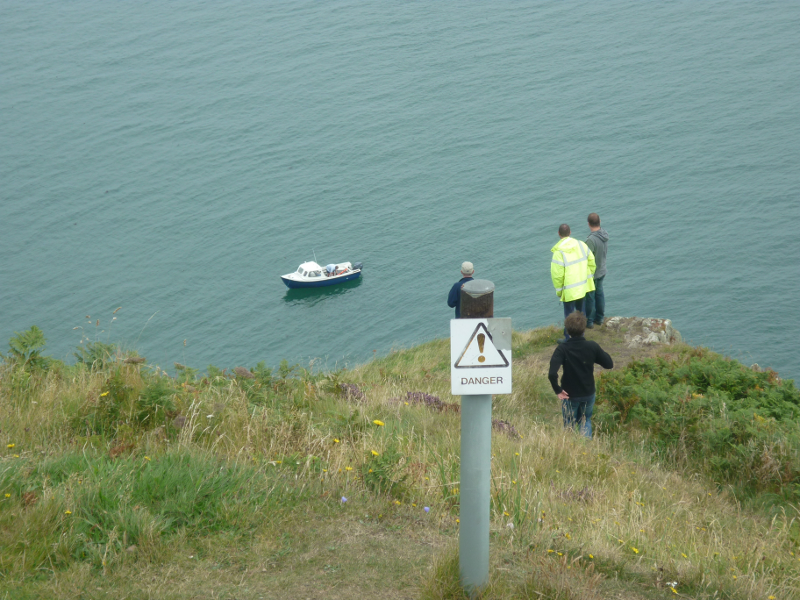 Given the addition of the life jacket and the parachutes it is hoped it will remain afloat for some considerable time and present a highly visible object likely to be recovered. CRTB simulation of flight with launch day wind, note 1st stage path in red. As demonstrated by his frequent appearance in the text and images of the day, Malcolm Mitton was a key member of the launch day team; sadly he passed away only just over a month later. 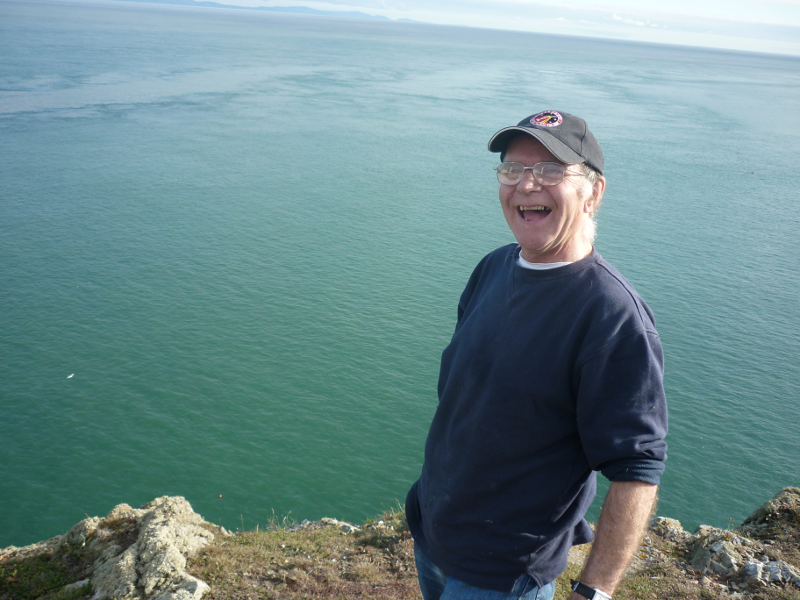 Malcolm was a retired Aerospace Engineer who later in life started his own company which worked on many different things from furnaces, to powder coating systems and industrial solvents paint strippers. I was fortunate enough to work with him briefly when he first volunteered for Starchaser 8 years or so ago. He continued there and worked with Anthony on a large bi-liquid engine, monopropellant thrusters and a SMART awarded funded peroxide hybrid. He could pretty much get his head around any engineering problem, loved chemistry and playing with making / machining bits in his workshop at home. 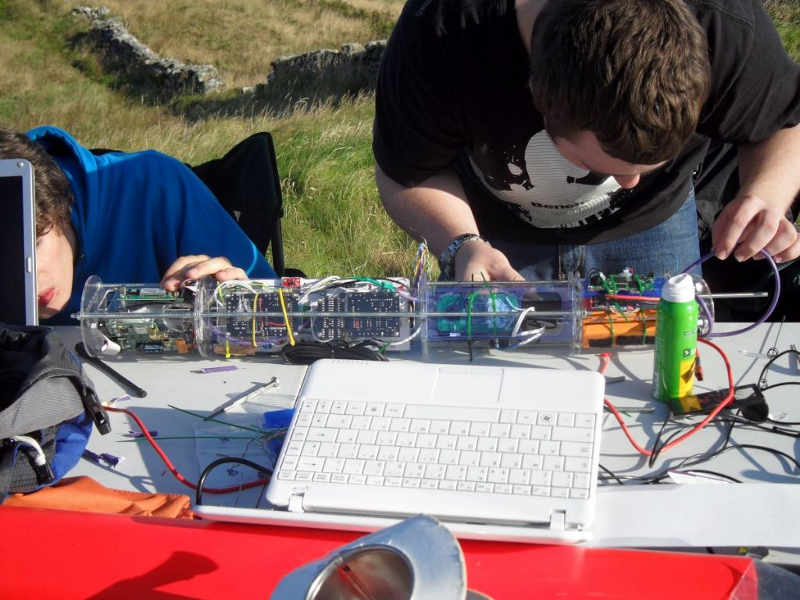 When he heard about the upcoming launch of Black Streak he volunteered to help, turning up with his own supply of spare igniters, and made a massive difference to the success of the launch. He will be sadly missed.